When I partner with a company that wants to build loyal relationships with their customers, I absolutely insist that they predetermine recovery strategies for top complaints. This single exercise positions frontline professionals to quickly determine recovery strategies that protect a company’s best customers from defection and strengthen loyalty after a service mishap. 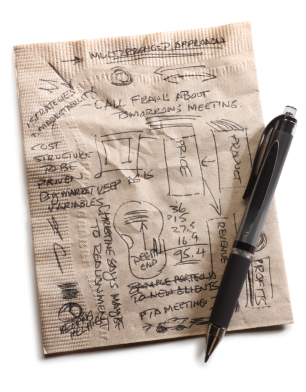 Sometimes the best resolution for the customer is for the company to replace the product. Clearly stating when this is most appropriate will help you offer quick and consistent resolutions. There will be times when it’s more appropriate, even advisable, to return the customer’s money instead of replacing the product. Can you decide now when it will be appropriate to refund the money? Or, do you want your employees to make this call? There will be times when no compensation is warranted. Determining this ahead of time positions staff to respond with greater confidence and keeps them from giving the store away. This might include a follow-up call or note to the customer. Proactively generating best-fit solutions for your top problems positions frontline staff to respond to complaints with confidence and consistency and helps ensure decisions are made that balance both the interests of the customer and the company. If you’d like to learn more about positioning your employees to make recovery decisions that protect both loyalty and profits, consider partnering with me for consulting, training or an unforgettable keynote. Learn more at MyraGolden.com. 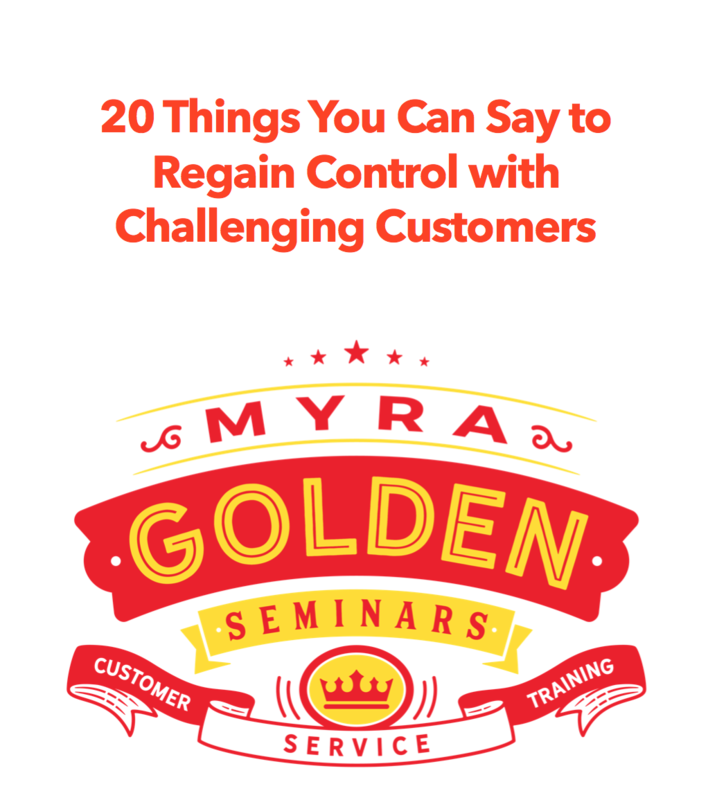 Myra Golden helps companies completely restore customer confidence in their brands after service failures. Considered one of the leading experts in customer recovery, she has helped hundreds of organizations rethink and redesign their complaint response processes so they are positioned to retain more customers, improve customer satisfaction, and increase profits. Myra has designed customer recovery programs for such companies as Verizon Business, McDonald’s, Coca-Cola, National Car Rental, Michelin Tires and Frito Lay. She is co-author of Beyond WOW! The Service Leadership Approach to Exceptional Customer Service. I’m sitting in my home office doing a run-through of my slide deck for a very special keynote I’m delivering at the GMA Consumer Complaints Conference in San Francisco next week, and I thought I’d share with you one of the focal points of the keynote: How to Genuinely Apologize Without Admitting Fault. I’m a big proponent of apologizing to customers after service failures occur, regardless of who is at fault. It’s important to me that my clients apologize to their customers sincerely and that they don’t open their company up for liability with that genuine apology. At the GMA conference, my audience will learn exactly how to genuinely and safely apologize. Here’s a little excerpt from my remarks. I hope this helps you. Studies show that an apology thwarts lawsuits and amasses positive publicity. Not only that, but a genuine apology after a service failure actually strengthens a customer’s emotional bond to a company. There is actually a big difference between an apology and a disclosure. An apology is an expression of sympathy, regret or condolence. “I’m sorry” laws adopted in 36 states protect the medical industry from litigation. Under the “I’m sorry” law, an apology is no admission of liability. While the “I’m sorry” law protects only the medical industry, all industries can benefit from learning to safely apologize to customers and in turn, reap the financial benefits of reduced litigation costs and reductions in customer defection due to dissatisfied customers. Don’t assume fault for the mishap and don’t blame others. Making an apology to customers after things go wrong is positively related to satisfaction with the recovery. Offer your customers a safe heartfelt apology after a service failure, and you will not only restore customer confidence and regain goodwill, but you should also realize the benefits of reduced litigation expenses and claim costs. Now you can give your representatives even more great skills for delivering the best customer experience and for handling difficult customer situations. Sign up for my email list and learn specific tips, approaches, and phrases to help your employees help your customers. My business was founded to help companies completely restore customer confidence and regain goodwill after service failures occur. I tell my clients all the time that a complaint is a gift. A complaint is a gift that can help you correct problems, retain customers and improve the customer experience. A couple of weeks ago I got a complaint from a customer. Being on the receiving end of a complaint was a little strange for me. I found myself having to practice what I preach. It was time for me to listen to my customer without offense, work to resolve the problem and regain my customer’s goodwill. My customer told me that the audio quality of a webinar she’d just attended was far below her expectations. I was shocked. But I listened and carefully responded using the 7 practices for handling complaints that I’ve taught my clients for more than a decade. After I felt certain that I’d effectively handled the problem and regained my customer’s goodwill, I tackled the problem. I played the 60-minute webinar my customer attended back in its entirety. Sure enough, there were times when my voice would drop for a few seconds at a time. I immediately knew what was wrong. 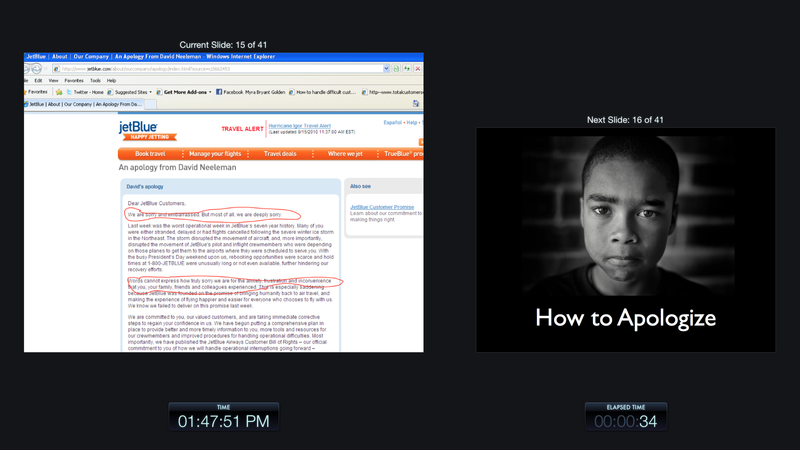 I had broadcasted that webinar from my iMac. I usually deliver webinars over a Dell. My Mac was directly in front of me and my speakerphone was right in front of the Mac. Every few minutes I’d glance over at my Dell, which was showing the live webinar, to ensure everything was running smoothly. Every time I looked away from my iMac, my voice would drop because I wasn’t facing the speakerphone. It didn’t occur to me that these glances were affecting my vocal quality. My customer gave me feedback on a problem that actually affected hundreds of people the day of the live web event. She was the only customer who took the time out of her day to give me feedback. This was critical feedback. I immediately went out and bought an earpiece to connect to my phone. Now I can talk and move about without risking good voice quality. My customer’s feedback led to me making a $14 investment in an earpiece and that little investment dramatically improved my customer experience for web events. A complaint truly is a gift. When customers give you a complaint, see this as an opportunity to correct the problem, regain customer goodwill and possibly even improve the customer experience for your customers at large. One of the easiest and quickest ways to diffuse anger, create rapport, and regain goodwill with unhappy customers is to apologize. Offering an apology to a customer who experiences a problem should be a natural response from customer service providers. Yet, recent research reveals the startling fact that 50 percent of customers who voice a complaint never receive an apology from the organization. Not only does an apology provide “soft” benefits such as creating calm, shaving minutes off of talk time, reducing stress on the employee, etc., but it can also translate into significant and measurable savings in decreasing lawsuits, settlement costs, and defense costs. Doctors and hospitals are beginning to discover what savvy customer service professionals have always known: sorry works. A new program for doctors, nurses, and hospital administrators called Sorry Works encourages doctors and hospitals to apologize quickly when mishaps occur and to offer a fair settlement upfront to families and their attorneys. The Sorry Works program has resulted in a dramatic drop in lawsuits. The University of Michigan hospital recently implemented Sorry Works and reports that the number of pending cases has dropped and defense attorney fees decreased from $3 million to $1 million annually. Clearly, sorry does, indeed, work. This morning I delivered a workshop in Philadelphia where I introduced my conciliatory customer recovery strategy to a client. The sole purpose of my customer recovery strategy is to completely restore customer confidence and regain goodwill whenever a customer feels wronged. The keystone of my conciliatory strategy is to apologize to customers. The expressions of these two participants are common and I hear this throughout the country in nearly every seminar I deliver. So, let’s look at their sentiments. Good point. 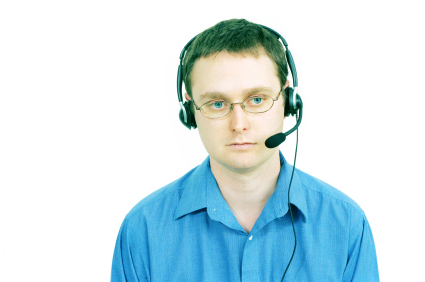 Almost never is the problem the customer service professional is responding to their fault. So why would they need to apologize personally for the problem? I can think of several reasons. It’s not about you personally. Of course it’s not your fault. But you are representing your company and you have a responsibility to actively work to regain customer goodwill. A sincere and unreserved apology conveys that you genuinely care about how the customer was treated. This is what it’s about…not you personally. Apologizing can increase customer satisfaction. Research by TARP has shown that when an apology is perceived as genuine, customer satisfaction increases 10 – 15%. Actually, an apology doesn’t have to be an admission of fault. And it’s not even about placing blame. The whole point is to convey that you genuinely care about how the customer was treated and to regain goodwill. I believe in apologizing to the customer whether the problem they experienced was a result of an act of nature, a third party, or even the customer. It goes without saying that I believe that we must apologize when the problem is the fault of the company. Several years ago I experienced a cancelled flight due to severe weather and ended up having to spend the night in the DFW airport. About a week after my mind-boggling stay in the DFW airport, I got a letter in the mail from the airline that included this apology. Notice that none of these apologies admit fault or pass blame. They are also all “safe” apologies. I encourage you to use one of these apologies today with an unhappy customer. The bottom line. If your goal is to restore customer confidence and retain more customers, you need to apologize to customers in the wake of any problem, regardless of fault. When you do, you create emotional bonds with customers and build and strengthen customer loyalty. Myra Golden invites you to explore her corporate complaint handling training resources at http://www.myragolden.com/goldenRules.php. Corporate trainers can use Myra’s complaint handling training to train staff to completely restore customer confidence after any service mishap. Learn more by going to: http://www.myragolden.com/store.php. Reproducible comprehensive participant workbook that drives home key points and serves as a reference point long after the training is over. High-impact PowerPoint slide deck that you can use as-is or customize with your logo and specific examples. Detailed trainer’s notes to help you quickly get ready to train. Certificate for free consultation with Myra Golden – Consult with Myra about the philosophy, objectives or delivery of this training program before you deliver it! Delivered digitally so that you’ll have this entire training system at your fingertips in minutes! How-to hints for delivering the very best training. You probably remember the story about dozens of JetBlue Airlines’ passengers being stranded for more than 10 hours on the tarmac without taking off. Would you believe that JetBlue still managed to get the JD Power & Associates Award for #1 Customer Satisfaction for the airline industry for that year? A lot of companies are afraid to apologize because they think an apology assumes responsibility or that it may put the company at risk for liability. And I think this is a huge mistake. JetBlue’s apology acknowledges their passengers’ “pain,” assumes accountability, conveys sincere concern, and the apology is direct. Most companies are too cautious to pull off an apology like this. Maybe the willingness to offer a genuine, bold apology after a service mishap is part of the reason JetBlue has topped the JD Power rankings for best in customer service for four consecutive years. If your goal is to restore customer confidence and retain more customers, you need to apologize to customers in the wake of any problem, regardless of fault. When you do, you create emotional bonds with customers and build and strengthen customer loyalty.